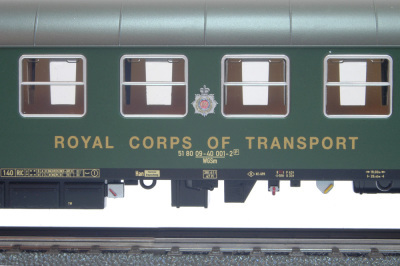 Given the special nature of this service, limited zone of operation and lack of publicity surrounding the train, it might be expected that no scale models of the coaches used would ever have been produced. Despite the unique RCOT rolling stock all being to standard DB construction and dimensions, which almost every continental model railway manufacturer have had in their catalogues at some time, accurate representation of the unique differences would require costly tooling alterations and research into prototypes which, by their very nature, did not encourage close inspection or detailed photography. 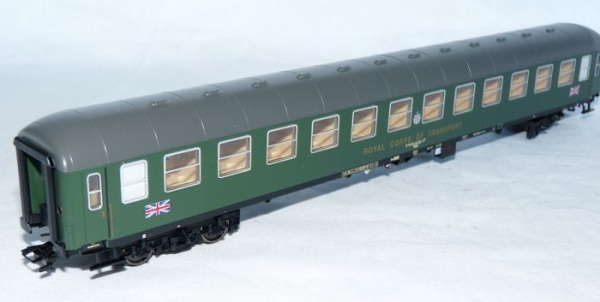 However, two manufacturers did produce models of the RCOT officer's coach, and a review of both models is provided below. Produced during the heyday of the Berliner, this model represents one of the two officer's coaches, in this instance No. 910 298. The model is based on the standard DB 2nd class compartment coach body of type Bm 234, fitted with MD33 bogies, and at 303mm length over buffers, is to correct scale length. The pre-computer era lettering is accurately and neatly applied, although the RCOT logo and lettering sits too low on the bodyside. Large format, "painted" Union Jacks are printed at each end of the coach, correct for the earliest version of the prototype, and the twin-leaf, sliding corridor connector doors and entrance steps are correct. Similarly simplified is the interior, which represents the standard 12-compartment interior of a normal DB 2nd class coach. The unique layout of the officer's compartments, ammunition room, sleeping and working accomodation of the prototype is thus not represented. In summary, if the modell been finished in the correct livery it would have served as an excellent basis for a modelling project to create the correct interior and underframe detail, but the model as produced is not an accurate representation of the real thing. version , but finished with computer lettering as 51 80 09 40 001-2 [P]. 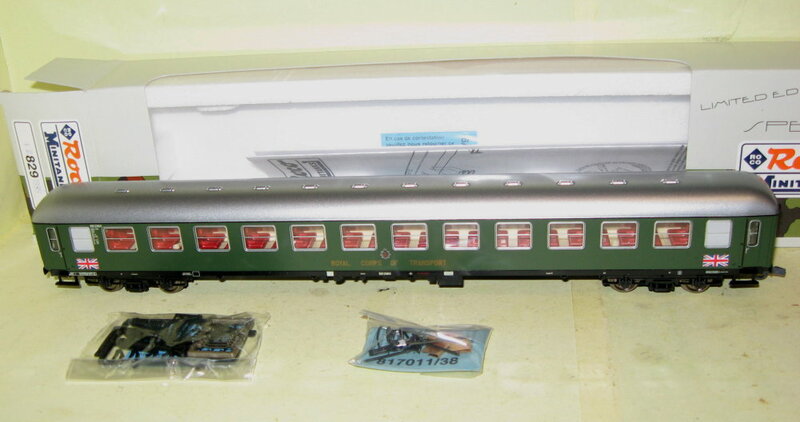 While the lettering is complete and correct, Märklin also chose to finish the model in chrome oxide green, not RCOT blue. Had this model been finished in the later ocean blue / cream colours, the lettering and livery would have been correct. The advance of computer-assissted mould making using cheaper materials for shorter production runs, together with the developments taking place in 3D printing, may mean that the RCOT coaches will one day be commercially viable as limited production series, ready-to-run models. Almost all DB standard prototype coaches have now been produced at some stage by model manufacturers, so interest is turning more and more towards the one-off and unique prototypes so far not produced. The commercial need for a variety of versions of the same model can also be met, as the Berliner coaches could now be modelled in both blue and blue/cream versions in RCOT service, as well as the charter train operator liveries applied by the companies that bought them after the Berliner's operations ceased.